Team Belgium have won their second Longines FEI Jumping Nations Cup™ title in four years after coming out on top in three thrilling days of competition in Barcelona. The European League champions, who won two qualifying legs leading up to the Jumping Finals, finished the third day of riding on 12 total faults after a tricky course produced only four clear rounds, including Belgium's Niels Bruynseels and Nicola Philippaerts. Italy had the opportunity to take victory but their star man Lorenzo De Luca knocked down the final two rails. Four teams finished the Nations Cup on 16 faults, leaving France in second place, Ireland in third, Italy in fourth, and defending team champions the Netherlands in fifth when all the scores were weighed. Other top eight nations competing were Sweden, who finished on 20 points for sixth place, followed by Austria in seventh on 20 points and Switzerland on 32 for eighth. View all the results here. Belgian Chef d'Equipe Peter Weinberg said: "We call ourselves the “Never Give Up Team” because in the middle we had two with 12 faults already but still we were fighting to the last rider, so this victory means a lot to us!" The marquees and stands were packed at the Real Club de Polo, site of the 1992 equestrian games for the Barcelona Olympics. On a gorgeous warm afternoon, Santiago Varela Ullastres of Spain has set a deceptively difficult course. After the first few riders, it became apparent the time limit of 80 seconds was not going to be a problem, but the strides between obstacles had to be spot on to keep the rails intact. Time after time, riders found themselves with a foot in the water element or a rail down on the Caixa Bank vertical, and even the final fence proved devilish for many. By the interim break only two riders had gone clear: Belgium’s Niels Bruynseels and Italy’s Riccardo Pisani. Lucky for them, they had ridden clear on Friday as well, which put them in line to share a €100,000 prize for double clears. Heading into the second half of the competition, Belgium and Italy were tied on zero penalty points, with their teams’ worst scores having been discarded. France, Ireland, and Austria sat just below them, tied at 4 points each. Once again pacing and spacing became an issue, as the third group of riders had their turn in the arena. Double-digit penalties abounded, and with only one more group of eight to go, there was a three-way tie for first, with France, Ireland, and Italy all sitting on 8 points. Would there be a jump off? The answers came with the final eight riders. Olivier Robert of France and Darragh Kenny of Ireland each had two rails down for 8 points apiece, leaving their teams on 16 points. Switzerland’s Steve Guerdat finished on 12 points, for a team total of 32. Sweden’s Peder Fredricson, European champion on a new horse, turned in a beautiful clear ride, a double for a share of the prize money, but it wasn’t enough to save his team’s 20-point final tally. Next up was Belgium’s anchor rider, Nicola Philippaerts, currently ranked No.15 in the world, who had gone clear on Friday. He also gave a textbook clear round, leaving Belgium on 12 points and putting pressure on the riders after him. World No.1 Harrie Smolders of the Netherlands started out with a solid ride. But the Caixa vertical caught him out too. With his 4 penalties added to his team’s 12, the Netherlands were out of the running for the win. After Max Kühner took down the last fence, putting Austria on 20 points, the crowd fell silent for the final rider, Lorenzo De Luca of Italy, for the make-it-or-break-it moment. He made it all the way around the challenging course, only to see the very last two rails knocked down, for 8 penalty points, leaving Italy on 16 points total and giving Belgium the win. Bruynseels paid tribute to his 12-year-old mare, Gancia de Muze, who helped Belgium to victory with the first clear round of the competition. He said: "I have a little bit of a special horse, so she’s not like all the others. She has really a lot of temperament so I have to do my course and my round. So I don’t mind going first and I don’t have to see the other horses, because we always have a different plan!" 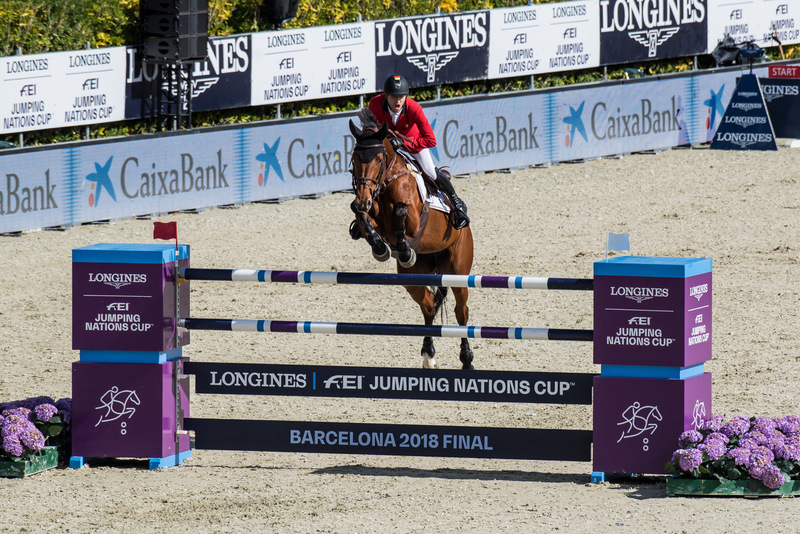 With such fantastic talent on display in Barcelona, the coming season of FEI Jumping is sure to be equally exciting. Follow all the action on FEI TV to see the world’s greatest jumpers giving it their best around the globe.